Canon U.S.A. has introduced its new EF 35mm f1.4L II USM lens, the first to use the company's Blue Spectrum Refractive Optics (BR Optics). The new optical technology relies on organic material for a higher level of chromatic aberration correction than other existing technologies. The molecular design of BR Optics refracts blue light (short wavelength spectrum) to a greater degree than other existing optical technologies including UD glass, Super UD glass and Fluorite, to control color fringing as effectively as possible. When placed between convex and concave lens elements made from conventional optical glass materials, BR Optics help to produce sharp images with outstanding contrast and color fidelity by thoroughly reducing axial chromatic aberration. Yuichi Ishizuka, president and COO of Canon U.S.A., said, "We continually strive to achieve the ideal lens performance, which has driven the development of Blue Spectrum Refractive Optics, found in the new EF 35mm f1.4L II USM lens. This technology is yet another 'first' in optical design introduced by Canon to enhance the performance of our lenses for our customers." The Canon EF 35mm f1.4L II USM lens takes 72mm filters and comes with Lens Hood EW-77B and Lens Pouch LP1219. Scheduled to be available in October, it will retail for $1,799. Adorama is accepting pre-orders now. MELVILLE, N.Y. -- Canon U.S.A., a leader in digital imaging solutions, today introduced the new EF 35mm f1.4L II USM lens for EOS system cameras, a wide-angle fixed-focal-length Canon EF lens that is the world's first to utilize the Company's newly-developed and exclusive Blue Spectrum Refractive Optics (BR Optics). This new optical technology utilizes organic material newly developed by Canon to achieve a higher level of chromatic aberration correction than other existing technologies resulting in outstanding high-quality imaging performance. "As the world leader in production of interchangeable lenses, having produced over 110 million EF lenses since 1987, it is with great excitement that we now introduce a revolutionary new technology to add to Canon's unequaled optical heritage when it comes to chromatic aberration correction," said Yuichi Ishizuka, president and COO of Canon U.S.A., Inc. "We continually strive to achieve the ideal lens performance, which has driven the development of Blue Spectrum Refractive Optics, found in the new EF 35mm f1.4L II USM lens. This technology is yet another 'first' in optical design introduced by Canon to enhance the performance of our lenses for our customers." In addition to BR Optics, the new lens incorporates two aspherical elements and one UD glass element in a 14 element, 11 group optical formula. The EF 35mm f1.4L II USM lens also features Canon's proprietary Sub-Wavelength Structure Coating, applied to the rear surface of the first and second aspheric lens elements to help combat flare and ghosting caused by light rays entering the lens at a large angle of incidence. The lens also offers best in class minimum focusing distance at 0.28m (approximately 11 inches) resulting in an increased maximum magnification of 0.21x -- ideal for capturing close-up subjects. Autofocusing is swift and virtually silent due to a rear-focus optical system and Canon's original Ring USM focusing motor. Full-time mechanical manual focusing is also available even when the lens is set to AF mode. 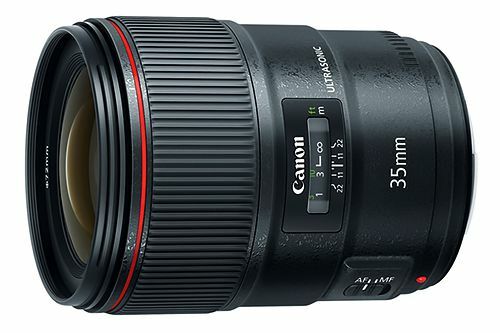 The Canon EF 35mm f1.4L II USM lens features improved durability over its predecessor. As with all L-series lenses, this new lens is highly resistant to dust and water -- making it ideal for outdoor photography, even in harsh conditions. The high-grade design of the lens provides users with a substantial and luxurious feel, as well as optimal operability. In addition, a fluorine coating on the front and rear lens surfaces helps to repel liquids and dust particles and makes the lens easier to clean. The new Canon EF 35mm f1.4L II USM lens is compatible with 72mm filters and will be supplied with Lens Hood EW-77B and Lens Pouch LP1219. It is scheduled to be available in October, for an estimated retail price of $1,799. For more information including specifications and an MTF chart, visit http://www.usa.canon.com/cusa/professional/products/lenses/ef_lens_lineup/lens_wide_pro.